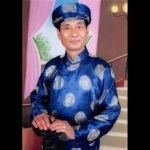 Denny (Thi Van Quach) Morris, age 67, of Lenexa, Kansas passed away August 10, 2018 at the Overland Park Regional Hospital. Visitation will be held from 5-7 p.m. Sunday, August 12, 2018 at the Porter Funeral Home in Lenexa, Kansas. A second visitation will be held from 1-7 p.m. Monday, August 13, 2018 at the funeral home. Funeral Ceremony will be held Tuesday, August 14, 2018 from 1130 a.m. to 1:30 p.m. at the Porter Funeral Home.